I discovered this amazing method to make tomato sauce last year, tried it again this week, and remembered why it was that I thought it was so good. First, you don’t need to get out your crank strainer thingy, and it works well for small batches. You only need 5 lb. of tomatoes to give it a shot, enough to fill up a large cookie sheet with quartered tomatoes. Cut up a large sweet onion, and lay it with about 8 to 12 garlic cloves (no need to peel them) on top of the tomatoes. Slide the whole cookie sheet full of veg into a 475 degree F. oven. After 10 minutes, reduce the heat to 400 degrees and continue roasting for about an hour, or until the onions are soft. A lot of the water will have evaporated from the tomatoes. Let them sit until they are cool enough to touch, then slip the skins off. Squeeze the garlic cloves to get all the good roasted mash out of them, then discard the skins. Blend all of the veggies into a smooth sauce, then simmer the sauce in a pan with 1/2 cup freshly chopped basil, 1/4 cup freshly chopped parsley, 1/4 cup olive oil, 1 T. sea salt, 2 T. sugar. You can add some red pepper flakes or cayenne, as well. I usually start slow on the spices, stirring, tasting, adding pinches until it is just right. This sauce is amazing straight out of the pot. After our spaghetti supper, I canned the extra, and I think cold packing it sort of deadens the freshness, but I love the roasted flavor. If you have a couple of late tomatoes in your garden, give it a go and see what you think. 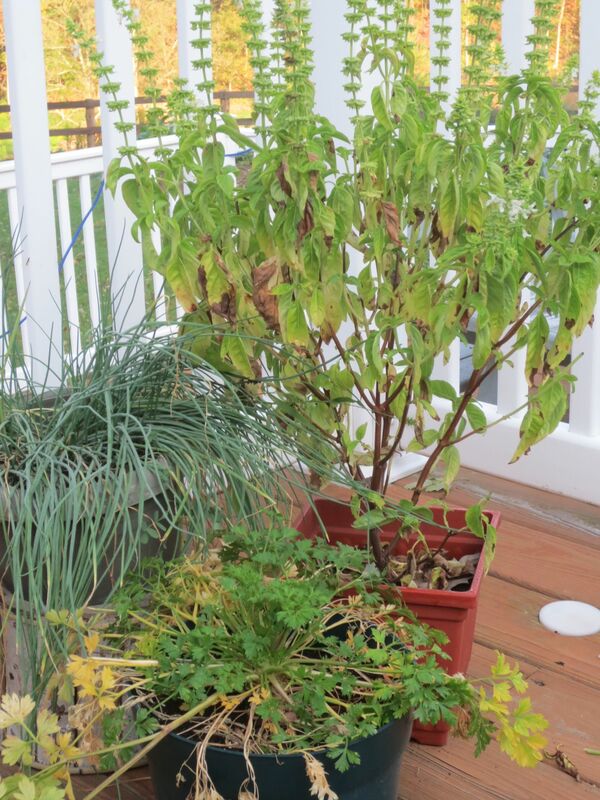 And here are my sorry looking used-up herbs, who have pretty much fulfilled their mission in life and are ready for a soaring disposal over the garden fence. This is what makes me sad about fall. One more happy photo to finish out the post. 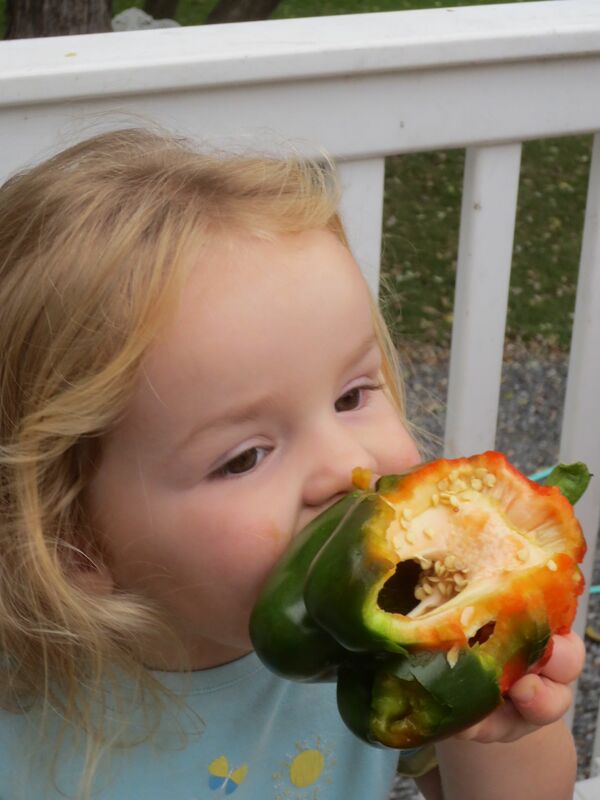 My little Rita has discovered a passion for sweet peppers. No food is quite safe around her, but this… leaves me speechless. Previous Post Oh Yeah! It is Friday! Need to try this recipe!! Thanks so much, sounds amazing! My husband got me 20 lbs of potatoes this week since they were on a really good sale, so I tried making freezer hash browns. Have yet to try them out of the freezer, but the process went well! 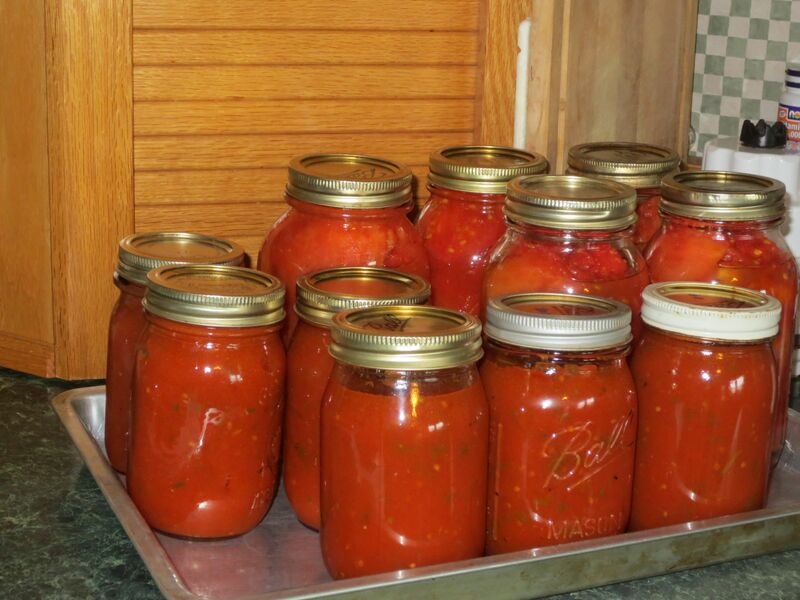 Becca introduced me to this way of making tomato sauce. She is one smart lady! How did you do the hash browns, by the way? That sounds like a huge time saver for busy days. Ah, I think I remember her saying something about this tomatoe sauce! I peeled and shredded, then soaked them in cold water for a while. Drained them really well and baked them on a cookie sheet for a 10 min. After they were cool, I froze them in bags! All the grating took a while since all I have is one little hand held grater. Sure others could find a short cut to that. Oh my goodness! She is such a lusty little carnivore. That pepper has been done in!